"I bet if we could get fifty people in one shop for a weekend, all working together, we could build a whole car body shell"
....how it all began with a friendly weekend get-together of "Metalshaping Enthusiasts"
In 2000, Wray Schelin invited George King and Tom Lipton to his Massachusetts shop for a weekend hands-on sheetmetal-shaping workshop. One of the projects was wire-forming an original design radiator shell that was to look something like that which adorned a late 1930's Alfa Romeo. Wray wanted to stress how the craft of Metal Shaping could unleash the Creative Potential and expand Freedom of Design for those who master it. Tom and George arrived, and the three friends went about the tasks at hand not yet aware that they had stumbled across what was to become the phenomenon know as MetalMeet. On Saturday night, while they were busy fabricating the wire form for the radiator shell, Wray said, "I bet if we could get fifty people in a shop for a weekend, working together, we could build a whole car body shell!" To Wray's surprise, both Tom and George jumped on the idea and said, "Yea, let's do it! ", and planning for the first annual FormFest, which evolved into MetalMeet, was underway. The first hurdle to overcome was locating a site that would be big enough to handle the event, but that was quickly resolved when George offered his 7000 square foot shop in Huntsville, Alabama for the meet. Within minutes, the idea became a reality, and the FormFest 2001 was underway. Now all they had to do was find forty-seven more "Metalshaping Enthusiasts" to help make it happen. Fortunately, Metal Shaping had grown in recent years both as a hobby and as a viable business, so finding forty-seven more "Metalshaping Enthusiasts" to participate in a free weekend-long workshop would prove to be easier than they thought. 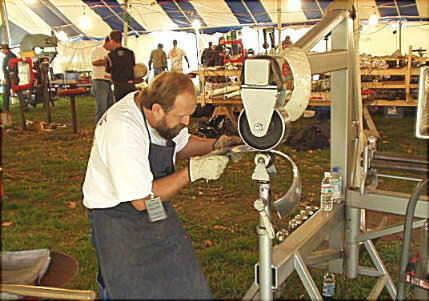 One of most pressing needs for FormFest 2001 was for everyone to bring as many tools and pieces of equipment to the event as possible. The word was put out on the "Yahoo! Groups" Metalshapers e-mail List, which Wray had co-founded, and which George and Tom were both charter members. Soon a sign-up list was posted, and momentum begun to grow. 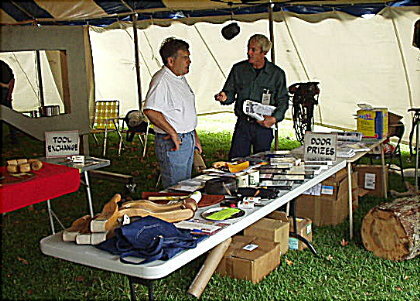 As the host, George decided that the event was to be free with the exception of covering the cost of materials that would be used. The first year went better than anyone had ever expected. Folks came in from all over the country, coast to coast. A lot was accomplished in the way of Metal Shaping, but something significant had been set in motion, and with the help of all the participants, it quickly developed into an annual event, one that many waited all year in anticipation to attend. Since the first FormFest at Georges shop in 2001, each year has seen a steady growth in interest in the Metal Shaping Craft, being helped along by the growing presence of TV shows dedicated to Motorcycle and Hotrod building. Membership on MetalMeet.com was growing at very fast pace, and attendance at the Annual International MetalMeet had grown to the level where it became necessary to find a new more weather friendly location to hold the event. 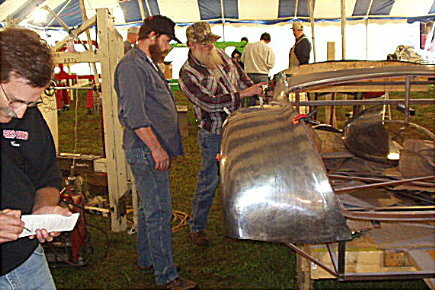 After two successful years being hosted by Randy Ferguson at his home in Robinson, Ill., the event was moved beginning with MetalMeet 2005, to the Crawford County Fairgrounds in Oblong, Ill. Since then, the small, friendly and gracious, Midwestern town of Oblong has welcomed and supported our events, and helped MetalMeet to grow and prosper.